Happy New Year! An opportunity for a fresh start should take the best of the past with it. Using your quiet time to ponder what’s peaceful in your cycling, now resolve to apply that peace to discovering a direction that sees you through the next hairpin. The famous L’Alpe d’Huez climb provides a dramatic illustration. Until you race it for real, it’s impossible to know what makes it so daunting. For me, it wasn’t so much the average gradient of 8% although there are steep pitches in the mix. It was more the combination of being able to see the top again and again bend after bend and feeling like it wasn’t getting much closer. Its thirteen kilometers seem to go on endlessly. Twenty-one hairpin turns are 2marked and numbered indicating many changes of rhythm before the famous finish. 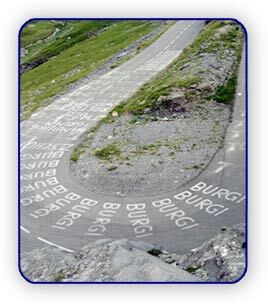 Up d’Huez, you get caught in the contrast between a seductive mountain top and its scornful signposts. You climb to another level and are immediately faced with the distance to the next hurdle. It’s almost cruel at first. About halfway up, I redirected my anaerobic thoughts and made those signs a comfort. Rather than letting the markers mock, I used them as guideposts to remind me what was overcome to arrive that much closer to the goal. The peace that accompanies sure direction is like the calm interim between switchbacks. It’s a guide that can steady you through the next setback. Even if the summit can only be glimpsed occasionally, use the decisions sought in calm to help you dance your way upward. We are thankful to catch sight of what’s ahead. We confess we sometimes crack at the task of getting there, well short of the summit. We ask for indications to plan our course, guidance in the going, and strength for the journey. Ponder Is my rhythm steady in the right direction? Affirm I can endure immediate trial on the way to completed tasks. Watch those benchmarks between bends noting what’s being done well and knowing more chances are ahead. Greg’s list is extraordinary not just because of the level of his goals, but because these goals were made with little indication of reality. These were the dreams of a star-struck teenager inside his second or third dozen races! Yet each goal was achieved! I always ask the dream question when initially helping an athlete set goals. I don’t want an edited version, but a spontaneous confidentiality about desire’s destination. My requirement isn’t that it has a basis in reality, but that it is truly what one dreams of doing. I used to think everyone would have the same answers – aiming at the sport’s pinnacle events. But I was humbled about how wrong I can be; everyone answers differently. We are thankful that we are all given dreams! We confess our age of reason sometimes hinders uninhibited imagination. We ask for reckless internal abandonment to dare to dream again. Ponder What pumps me up? What is my dream in cycling? Affirm I am in wonder about how my bicycle can transport me toward accomplishments arranged for me. Watch those fantasies turn into a well-ordered to-do list. 5The Message, Copyright © 1993, 1994, 1995, 1996, 2000, 2001, 2002 by Eugene H. Peterson.